Get ready for an adventure that few have received. Plan your vacation to stay in the Beach Caboose......2 original cabooses from Burlington Northern set on its own tracks, with all of the original structure, very clean and comfortable and very fun for kids or kids at heart. While you are there look for the red button that when pushed will make you think you are actually riding the rails! If you reserve the Cabooses and The Train for the same dates in the comments mention the special rate of $225 a night, cleaning fees apply. The bedroom area features a very comfy queen size bed that requires a step stool for most people. Under the queen bed is a cave like area that kids would have a love to sleep in sleeping bags that you bring from home. The dining car has a futon with extra bedding provided. It will sleep 2 small sized people. 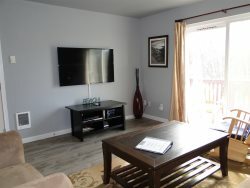 There is a 55" TV, connected to cable, in the living room with a love seat sized recliners and one chair. The dining car has a 40" TV not connected to cable with several movies to choose from. All the movies are geared towards kids. However grown ups like them too. You can nestle down on the futon with your pillows and blankets and popcorn beside the fire place and if there is storm you can enjoy that too under the sky light. No matter how big the storm gets you will be sitting pretty in a 60 plus year old caboose that is solid as a rock. It is really fun, I have been there and done that. There is a Koi pond, with a water fall and a fire pit beside it. Also picnic tables and chairs on the deck and a BBQ for your enjoyment. The cabooses sit at the end of a very quiet paved road and kids will love to bring there bikes as there is lots of room to ride. The path to the ocean is beautifully trimmed so you feel like you are walking through an enchanted forest. In a few feet you are in the dune grass and right on the beach. The walk is just 10 minutes and you can spend hours on the beach while just walking back to the caboose to retrieve what ever you forgot the first time.In the rainy season the dunes have water in them but you can access the beach right down the street at the State Park. One dog is allowed with additional fee and not over 35 pounds. So bring the family dog to romp on the beach with you. Wi Fi, Cable, Full Kitchen, Beach Access, during the rainy season the dunes can be full of water but you can access the beach at the State Park just blocks away, outdoor seating, We no longer provide a bbq as it was abused and destroyed to often. But the fire pit is fun for hotdogs and s’mores.Gas Fireplace and electric fireplace, Washer/Dryer. One dog 35 pounds or under is welcome with a additional fee. This AIRBNB was one of the best that I have ever stayed at. The Caboose is super cool, well appointed, clean and in an excellent location. This is one that I will definitely stay in again. Great rentals. No complaints, we will return again soon. Lady at check in and check out was friendly and helpful. The caboose is a great spot for family. We plan on coming back and renting the entire train next time very soon, we will definitely return as long as it doesn't sell. We will definitely be checking out the rental homes in the area as well, never again will we pay for a hotel near Ocean Shores again! Ricks Beach Rentals is our new, Go To. What a fun time! My girls loved it and look forward to coming back. Well kept, comfy, and its a train! Everything was as advertised and quite delightful! Kitchen was well-appointed with cookware, etc. and I felt safe, welcomed and secure. Loved the Caboose. A real work of Art. Very clean, warm and comfortable. Quiet and close to the beach also. I would stay again in a heartbeat ! !